Franzi's and Annelie's Weekly Journal: We had friends from Germany! During this school week, nothing really special happened despite the fact that we had some visitors again. Franzi’s Boyfriend, Luca, together with her two friends, Julia and Jana, came from Germany to visit her in the Philippines after travelling around Luzon. They were eager to see how our work looks like. On Monday and Thursday, we showed them our normal schedule at St. Francis. We first went to our classrooms for English, Science and Math classes, then went to the Library and read stories in daycare and kindergarten. The kids were so excited to see new faces and lost their shyness by asking a lot of questions. It was really fun to see how our friends and the students interacted with each other. On Wednesday, we could continue with our handball tutorial during P.E. 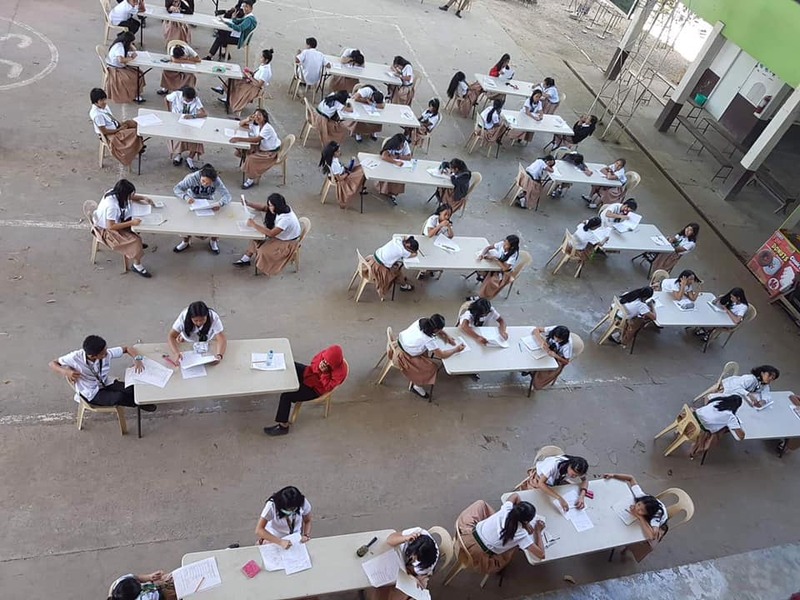 class for Grades 7 to 10. This time, we started to get used to the ball with some passes and throws after a warm up specialized for handball. The students participated very well and they seem to had fun practicing their handball skills and playing with the ball. You could see that they already had some experience in dribbling and passing through basketball. So, we could already play a little handball game at the end of the day with grade 10. We only have few weeks left until the end of the school year so we will speed up and introduce some defending and attacking techniques and tactics. We are confident that we will see a real handball game at the end of our tutorial. Franzi's and Annelie's Weekly Journal: Our Handball Class has Started! Back to school after that exciting sports week, we had normal schedule back. 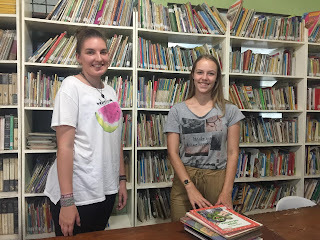 We experienced again interesting lessons with our grade 5 and 6 students and organized the library where we can already see a progress, but there is still a lot to do until the end of the school year. We had a lovely time during the storytelling in daycare and kindergarten. This week, we had company from one of the other volunteers from our German organization. Her name is Anis and she is working in an orphanage in Bacolod City, which is about one hour away from Silay City. She was curious about our new work at school. We had a great time together and the kids liked listening to her story. 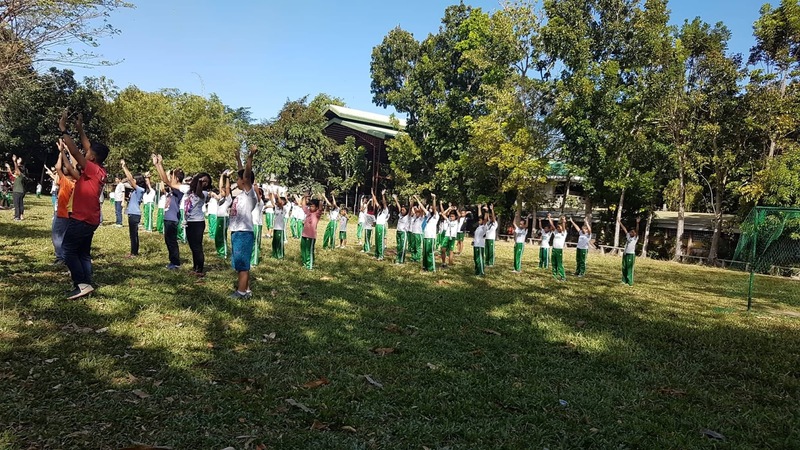 During their Physical Education (P.E.) class last Wednesday, we started to introduce handball to the junior high school students, which we will cover for the rest of the school year. Few weeks ago, the kids asked us what sport we did back in Germany and when we answered handball, they were quite confused because they have never heard of handball before. So, we started to introduce it to them this week, explaining the sport and its rules. After that, we showed some videos of how the game looks like and their reactions were gorgeous. You could really see and hear their excitement when they finally knew what handball is and we hope they will have a lot of fun playing it in the next weeks – because we are really excited. The first week of March was a really special one for us because it was St. Francis’ annual Sportsfest week. The students enjoy different sports activities and embrace their skills and talents . On Monday, all junior high school students from grades 7 to 10 performed their cheerdance, which they prepared very well the weeks before. Everyone did a great job and we really admired their nice dances. At the end, the Blue Panthers (grade 10) won the cheerdance competition for the first time after 3 years! They were so happy and some cried tears of joy. Not only the students from junior high school showed their dancing skills on Monday. The kids from daycare, kindergarten and elementary school presented wonderful performances which everyone enjoyed. Congratulations to all students and their teachers! The following days, the students from different grades, especially junior high school, had competitions in Volleyball, Basketball, Football, Swimming and Track and Field where they competed against each other – everything for fun of course. Every student did a great job and gave its best for the team and had the chance to improve and discover their talents and skills. All in all, it was a really nice week again with a lot of fun and sports and we hope everyone else enjoyed it as much as we did. During the third week we already had something like a routine. In the morning we went to the classes and to the library and in the afternoon we read the stories for the little children. But there was also something new in our schedule. 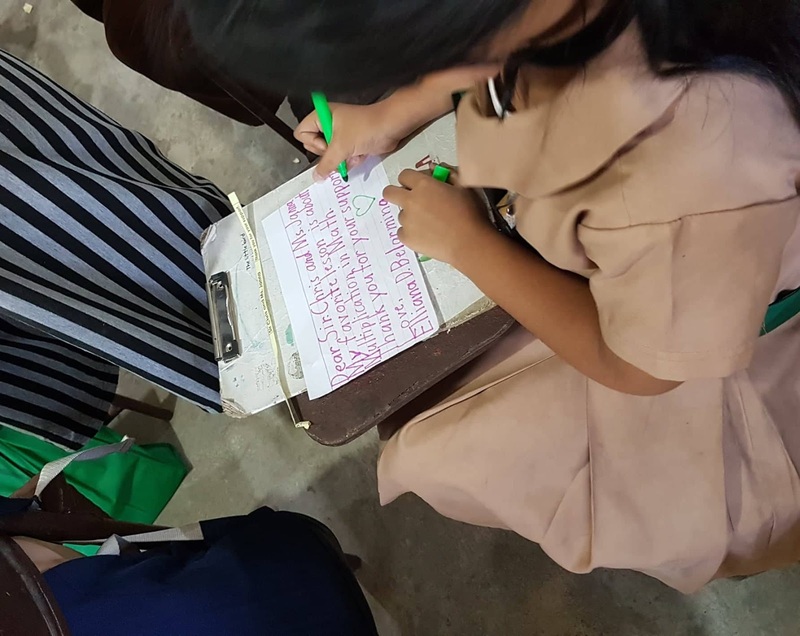 After the regular classes of the students, the sponsored students had to stay another hour at school to write the letters for their sponsor. We started in grade one and continued every day with the next grade. All the students were really happy to draw and write some words for their sponsor. 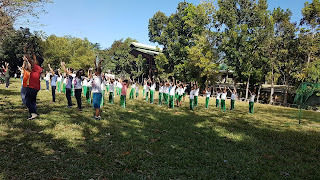 We also joined the practices for the sports fest in March. So all the high schoolers had to practice during P.E and after the school for their cheer dance competition and even the ones from elementary school started to learn a dance which they are going to perform. 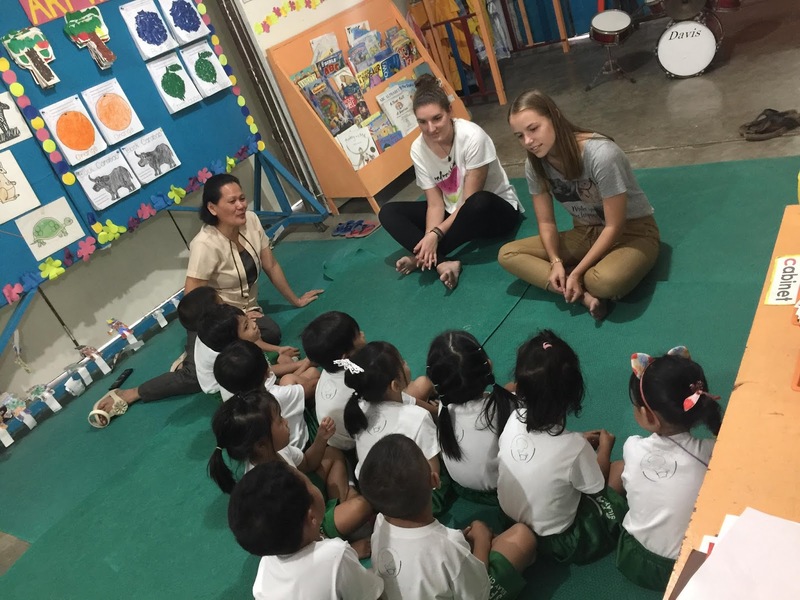 So it was another exciting week and we're looking forward to all the following weeks where we have the opportunity to work with Tapulanga Foundation and the St. Francis of Assisi school! We, Annelie and Franziska, are two german girls who came as volunteers to the Philippines. We are now assigned in Tapulanga Foundation where we're going to stay until July 2019. 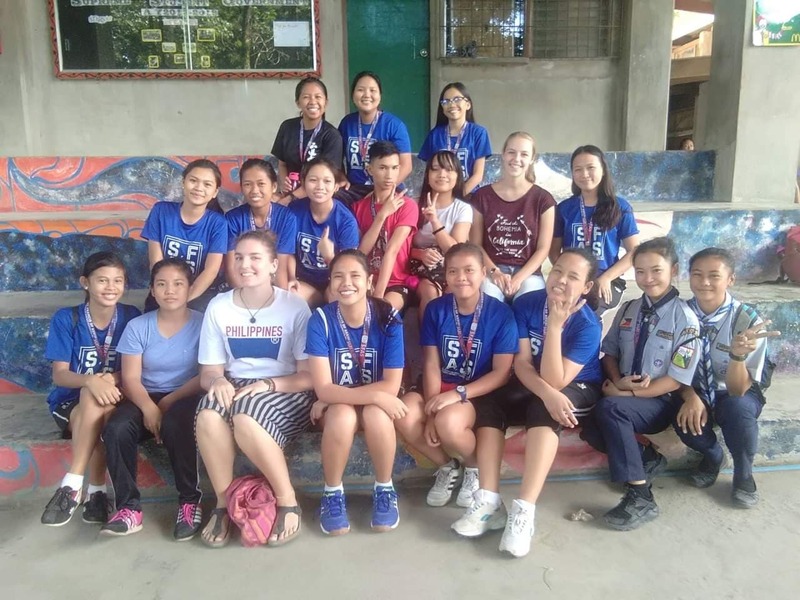 In this blog we will write about the activities we did during our week in the school of Saint Francis of Assisi. The first three hours of the day we're joining grade 5 + 6 in the subjects English, Math and Science. During this time we assist the teacher and help the students with their exercises. 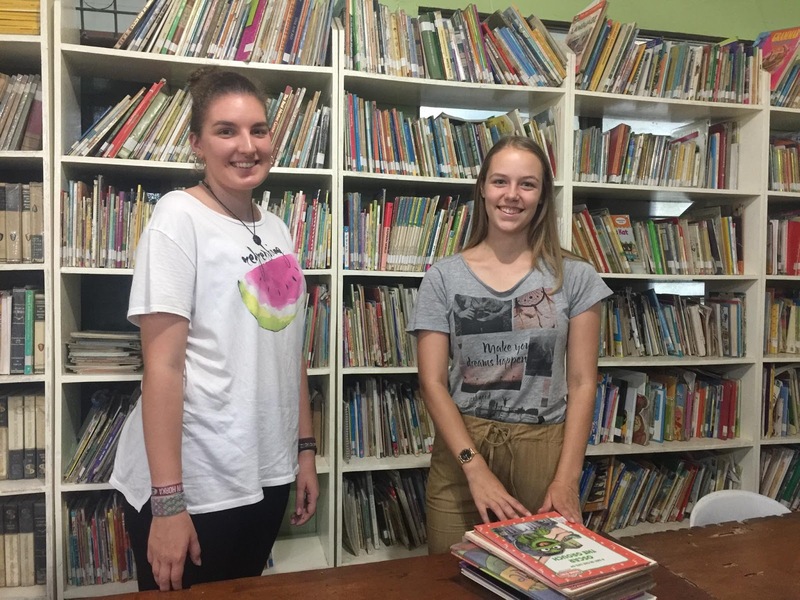 Before lunch time we spent one hour to reorganize the library so the students have a better overview about the books the library is offering. At 1pm we start going to the daycare and the kindergarten where we're part of the story telling. The only irregular day is Wednesday where we're the whole day assigned in the P.E classes of the high school. So especially during the first days of our new work we started to observe everything, get to know everyone and try to remember their names. In our second week everything was about the exams of the third quarter. Which means that all students had two exams on Wednesday, two exams on Friday and their performance task on Thursday. Due to this events we spend most of the time in the library where we can already see first progresses. Moreover we had our first experiences reading some english stories in the kindergarten. 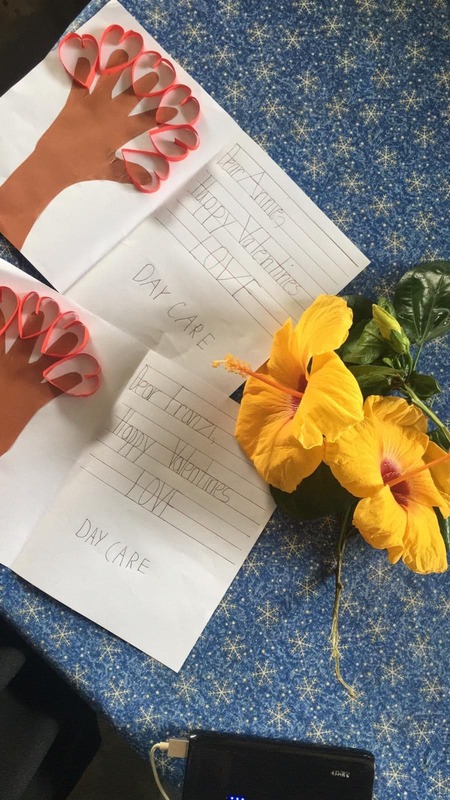 And there was also the day of Valentin which the students celebrated a bit eventhough they had their performance task this day. So thank you very much for all the presents, which were really cute, and belated happy Valentine's to everybody! Tapulanga Foundation held its 10th benefit dinner entitled Eat. Share. Love. 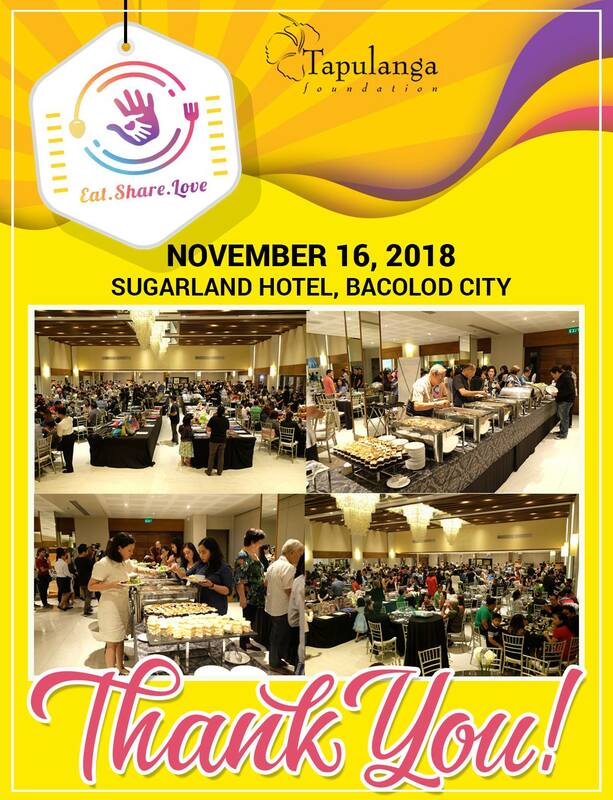 2018 last November 16 at Sugarland Hotel, Bacolod City. There were 320 people who attended, the biggest by far in attendance since the first benefit dinner. The sumptuous buffet menu included the following: Vietnamese spring rolls, chorizo empanaditas, mixed seafood chowder, Greek salad with Feta cheese, olives, walnuts and honey-balsamic dressing, pasta Felix, chicken relleno, beef yakiniku, roast porkloin with mango-pineapple sauce, mixed vegetables, rice and one round of soda. Desserts included Swiss Chocolate Cake with Caramel Crunch, Sansrival. The Pre-Kindergarten and Grade 10 scholars entertained everyone with their Maskarra dance presentations. The main event of the night was the silent auction with more than 400 donated items ranging from gift certificates (hotels, salon, spas and restaurants) to food, kitchen wares, shoes, toys, locally crafted and imported bags, paintings, home decors, etc. Proceeds of this event will go to the Scholarship program of Tapulanga Foundation. To those who supported this great cause, to all sponsors and to those who attended, THANK YOU SO MUCH!!! Prudential Guarantee and Assurance, Inc.
Southern Auto Mart & Trading Corp. Please click to view Silent Auction Donors and Items. For more photos of the event, please click this link.